SAN FRANCISCO, Nov. 28, 2012 /PRNewswire/ — Award-winning mobile app developer Red Hill Studios announces the release of Be There: Yosemite, the second in a series of innovative ‘mobile virtual reality’ apps that let you explore famous locations as if you were standing right there – viewing the scene. With Red Hill’s proprietary Panopticon™ technology, this revolutionary app reads the gyroscopes on the iPad/iPhone and updates the view in perfect sync with your movements. Immersive soundscapes featuring the native birds and animals complete the mobile VR experience. 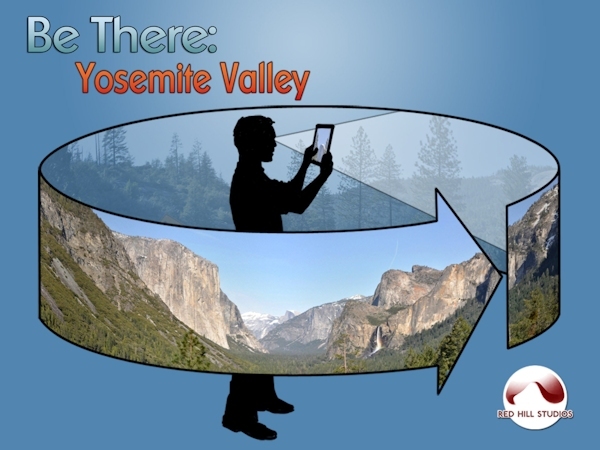 With Be There: Yosemite, you can gaze upon the magnificent Yosemite Falls … then as you physically move the iPad to the right … you scan Yosemite Valley as Half Dome comes into view – just as if you were actually standing in the valley. Mobile VR puts you right into the scene – converting the iPad into an amazing, moveable window. Stand along the Merced River as you peer up at majestic El Capitan … then sweep your iPad ‘window’ to the right to see deep into the valley and gaze at the rainbows in the mists of Bridalveil Fall. The Be There: Yosemite app, now available in the Apple App Store, provides insightful, detailed pop-up descriptions of more than fifty locations and peaks in the valley. Through a collaboration with photographer Russ Cary and his acclaimed “Yosemite Hikes” web site, the app also features dozens of beautiful scenic shots of valley highlights. The app includes eight explorable mobile VR nodes: Tunnel View, Bridalveil Fall, El Capitan, Yosemite Falls, Stoneman Meadow, and several nodes along the inspiring ‘Mist Trail’ that leads to Vernal Fall. Red Hill Studios, an award-winning transmedia developer, created the acclaimed Be There: San Francisco and Painting with Time iPad/iPhone apps. It also creates playful science-based games, therapeutic games for health, and immersive museum exhibitions. Red Hill Studios is based in San Rafael, CA.